The Senate Committee of the Whole held a hearing Friday evening, ostensibly to hear all sides of controversial legislation aimed at restoring RTPark tax breaks to V.I. Internet service providers that Gov. John deJongh Jr. vetoed. The hearing, called and chaired by Sen. Shawn-Michael Malone, began with a video produced by the Legislature’s taxpayer-funded, internal media department promoting the legislation, which Malone sponsored. It featured employees of the Legislature, praising Malone and other senators, praising the legislation, attacking its opponent’s personal motives and urging the Legislature to vote to override the governor’s veto. Malone’s legislation skipped the committee process and was introduced by Sen. Nereida "Nellie" Rivera-O’Reilly as an amendment to an unrelated bill during the April 24 legislative session. O’Reilly read the amendment aloud, then said it was needed "because of the lack of clarity on what businesses should be solely directed to the tech park," adding that "a number of applications are on hold." There was no testimony, discussion or debate before the senators approved it unanimously in a few seconds, then moved on to the next in a long series of votes on bills. On May 16, Gov. John deJongh Jr. vetoed the bill, saying he had been working with the RTPark to resolve problems in the program, but "the overall situation has now been exacerbated by a well-financed campaign of misinformation that seeks to defend the actions of the Senate, fundamentally changing the RT Park’s role and function." DeJongh also warned "the amendments seek to make permanent what may well prove to be an improper grant of benefits to Internet Service Providers that have cost – and will cost – our Treasury dearly. This last action not only unilaterally took tax-paying entities off the tax rolls but has put smaller and locally-owned and managed businesses at a very unfair disadvantage in this new and developing industry by forcing them to compete against larger companies which do not have to pay the taxes the smaller businesses must pay." 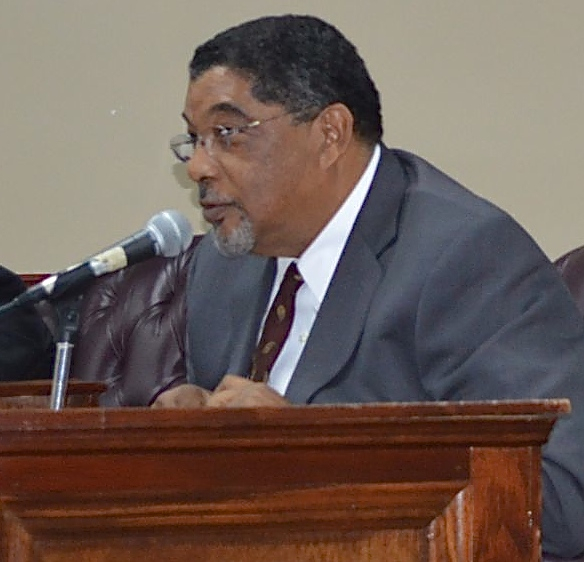 DeJongh later released three legal opinions prepared by Attorney General Vincent Frazer at his request that conclude ISPs cannot legally receive RTPark tax breaks and tenants must have an actual presence on the RTPark grounds to meet the legal and common definition of "tenant." Those opinions, which are binding on executive branch agencies, led to the V.I. Internal Revenue Bureau notifying the ISPs their RTPark tax breaks would expire in December and not be renewed. Malone is seeking the Democratic Party nomination for delegate to Congress. Shortly after the veto, St. Croix attorney Stacey Plaskett, who is running against Malone in the upcoming Democratic primary, seized on the issue, speaking publicly and sending letters to newspapers decrying Malone’s legislation. "The EDC program requires notice in local papers and public hearings; the RTPark does not have this requirement. By expanding the businesses eligible to go to the RTPark, the public will be left in the dark about what companies receive a tax exemption and why. The RTPark can and should play a role in the growth of the territory. This is not to say that the companies receiving tax exemption are not good for the territory. The people however, have a right to know how much these exemptions are costing the taxpayers, what benefits we receive in return, and how the millions in public funds flowing into the RTPark have been spent," Plaskett wrote in one letter. Harrigan stated the Legislature’s position on the matter before the hearing began, saying the hearing was called in part "to determine why the public has been misled on this issue," in the government-funded advertorial video at Friday’s hearing. In the video, Harrigan said Malone’s legislation was approved by the Legislature "in order to save the UVI Research and Technology Park Program – and the revenue, to include more than 200 jobs associated with it." Later in the hearing, questioning with company and RTPark officials revealed that this number reflects all the ISP employees of Innovative, Choice and Broadband V.I. and all other RTPark tenants, not the number of jobs created as a direct result of RTPark tax breaks. Malone and O’Reilly also appear in the video, praising the tech park and accusing opponents of their legislation of ill-intent. "The program was suddenly jeopardized by the attorney general’s opinions," Malone said. He added the legislation he sponsored expanding the law’s definition of e-commerce and "knowledge-based" to include ISPs was intended to "eliminate misinterpretation of the law’s intent." "There has been an effort to misinform the public," O’Reilly claims in the taxpayer-funded video. The video repeatedly asserts that no tax revenues would be lost with the passage of Malone’s legislation. "There are no businesses being taken off of the tax rolls or given new tax benefits," Harrigan read from her script. 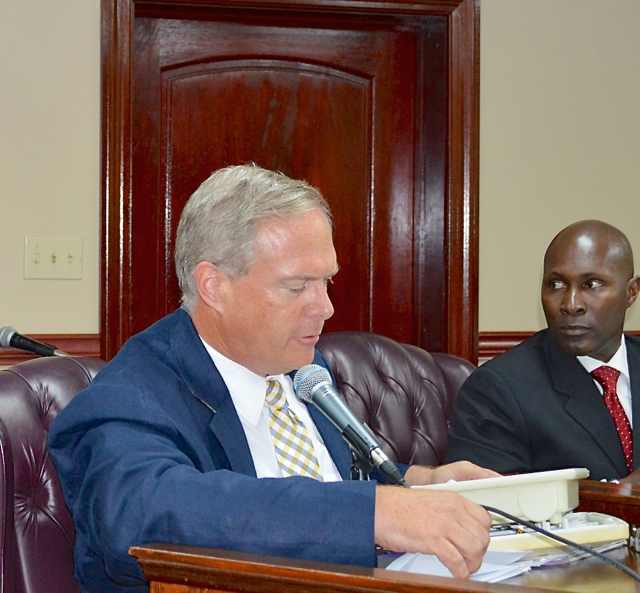 "The amendment does not take businesses away from St. Croix, the amendment does not take taxes away from the government," O’Reilly said in the video. Speaking with the Source last week, O’Reilly said keeping the ISPs off the tax rolls would cost the V.I. government about $2.6 million in lost tax revenue annually, which she said was far less than deJongh was suggesting the territory would lose. (See: RTPark Claims: ‘Clarify’ Rules or Puerto Rico Will Take All the Clients in Related Links below) If the number O’Reilly estimated to the Source is accurate, that would represent about $39 million in lost tax revenue over the 15-year term of the ISP’s agreements. Elsewhere in the Legislature’s video, Malone said the RTPark program "was suddenly jeopardized by the attorney general’s opinions," and the goal of the legislation Malone proposed was to "eliminate misinterpretation of the law’s intent." The three companies are listed on the RTPark website on a page entitled "partners and tenants." Although RTPark has routinely announced contracts for everything from janitorial service to contracting for broadband services (See: "Choice Official Chosen" in Related Links below), it did not send out press releases announcing that it had given Innovative, Choice and Broadband V.I. broad tax breaks and there was no public discussion or newspaper reports of the tax breaks at the time they were given to the three local telecom companies. After the video, Frazer, Justice Department and Internal Revenue Bureau officials testified against the legislation and received hostile, pointed questioning. Frazer in particular, testifying about the history of his legal opinions, reiterated the legal reasoning that led him to conclude the law did not allow virtual tenants at the park, nor ISPS. Frazer said he looked at the statutory and industry definitions of ISPs to see if they fit the characteristics of knowledge-based or e-commerce businesses. "There is uniformity in defining an ISP as simply a "company which provides end-users with a data connection allowing access to the Internet and associated services, he said, quoting from a glossary of terms of the Organization for Economic Co-operation and Development. "Time and time again, ISPs are primarily defined in terms of their dominant function – providing a pipeline or conduit for the provision of basic connectivity to the Internet." This is not a knowledge-based business because it does not meet the V.I. statutory requirement to use "a high level of research and development to create intellectual assets and property," nor similar definitions used in the industry and by other jurisdictions. Frazer said ISPs are not "e-commerce," arguing, in essence the ISPs would be the marketplace, not the businesses in that marketplace the tax breaks are meant to encourage. A similar analogy would be to say ISPs are the road that e-commerce travels on, not the cars or businesses using the road. Frazer said the government and the RTPark had worked out a plan to allow tenants to share space at the RTPark, to allow the current "virtual" tenants to come into compliance and keep benefits. Sen. Terrence "Positive" Nelson questioned Frazer about the legal opinions Frazer issued, repeatedly saying "that’s your opinion," asserting that the legally binding work product of a sitting attorney general entitled an "opinion" has the same significance as a personal opinion shared over dinner. Sen. Kenneth Gittens pulled out a March 25, 2008, memorandum of understanding between the government and the RTPark, signed by deJongh, Economic Development Authority Executive Director Percival Clouden, RTPark President David Zumwalt and others. He directed Clouden to a footnote on the bottom of page four, which briefly mentions virtual tenancy. "Do you concur now there is something in this document that speaks to virtual tenants at the RTPark?" Gittens asked. "Yes Senator," Clouden said, adding that it was a footnote and he did not recall the question being discussed when the MOU was signed. Several senators focused on the potential for uncertainty, confusion and even litigation if benefits that were applied for and approved in good faith are made null and void. "My concern is the existing contracts these individuals have and you are telling me them they don’t have them anymore. Are you going to have lawsuits?" Sen. Diane Capehart asked. Frazer said there was some risk of that, but more risk of federal intervention if they did not, and more harm to the territory from the loss of tax revenue if they did not. "We understand very well the impact," Frazer said. "We felt once the action was taken we would have some discussion with these individuals so we can minimize the impact on them. But our primary goal was to protect the program and make sure the university gets the benefits that were intended by the statute." "Who reimburses these companies for the money they spent, because clearly they spent it on the basis of expecting benefits in return," asked Sen. Clifford Graham. Frazer said they anticipated the issue but had not gotten to a solution yet. "However, if they claim benefits they are not entitled to under the law, we have a right not to renew those benefits … and to reject any attempt to take advantage of the benefits they are not entitled to," Frazer said. Zumwalt testified in defense of the RTPark’s approach to accepting tenants, saying “no park tenant agreement has ever been approved in haste or in secret." He said the average time required to move from an executed term sheet to an approved park tenant agreement was approximately 72 calendar days. He warned that Puerto Rico was offering more generous tax breaks on looser, less regulated terms, giving large tax breaks to very rich individuals in exchange for nothing at all but setting up residency in Puerto Rico, and suggested the territory would lose out if it did not move to loosen its rules more too. "Puerto Rico has an individual-level tax-break program to attract high-wealth individuals … Puerto Rico is saying here is a program and you can come without bringing any business first," Zumwalt said. Representatives of the three affected companies testified in favor of Malone’s legislation to explicitly include their business types in the tech park tax breaks, arguing that they had applied for them in good faith, kept their end of the agreement, paying fees to the RTPark, and also needed the tax breaks to survive against competition. "The government of the Virgin Islands is trying to go back on that RTPark agreement. … If that is allowed to happen, we will lose jobs," said Broadband V.I. cofounder Mike Meluskey. Without the large tax breaks, "we won’t be able to hire as many employees, … we won’t be able to invest as much capital," Meluskey said. "We have doubled our employment (since getting tax breaks) because we have been able to invest heavily." Meluskey showed one of his company’s broadcast antennas, arguing that the use of high-tech equipment and the fact that engineers worked for his company made it a "knowledge-based business." Tony Shepherd, CEO of Choice Communication, made a similar case, saying termination of the company’s tax breaks "puts our local employees at risk. It puts our future at risk." He also argued his company was a "knowledge-based." "It was sort of implied that we do not impart knowledge," Shepherd said, saying he himself has given lectures at UVI, as a counter-example showing that Innovative’s ISP and cable television companies impart knowledge as a central part of their business model. Shawn O’Donnell, chief executive officer and president of Innovative Communications, said CFC, its parent company, "cannot continue to keep pumping capital into the company. At some point it must become self sufficient." CFC took control of Innovative after former owner Jeffrey Prosser borrowed half a billion dollars, pledging the company as collateral, then sold a portion of that collateral off in a "preferred stock" issue to finance a failed venture in Belize. CFC took the company in a credit bid, after it was unable to sell it at a price that would pay what Innovative owed CFC. At the time, CFC officials indicated they hoped to invest in new infrastructure, improve then sell the company. With or without tax breaks, it must make the company profitable or eventually declare a massive loss on its books. Several senators said they were still considering the issue and were not decided one way or another. A larger contingent, including Malone, Nelson, O’Reilly and Sen. Craig Barshinger, said they supported overriding the veto. Sen. Alicia "Chucky" Hansen was the sole senator to vigorously oppose overriding the governor’s veto and keep ISPs and "virtual" tenants in the park. The Legislature is expected to consider overriding the governor’s veto during session scheduled for Wednesday.